In the wild honey badgers are most commonly solitary animals however you may occasionally find a few badgers together…this will most likely be mum and pup (as youngsters stay with mum for 1.5- 2 years) or it will be a bachelor group of males. 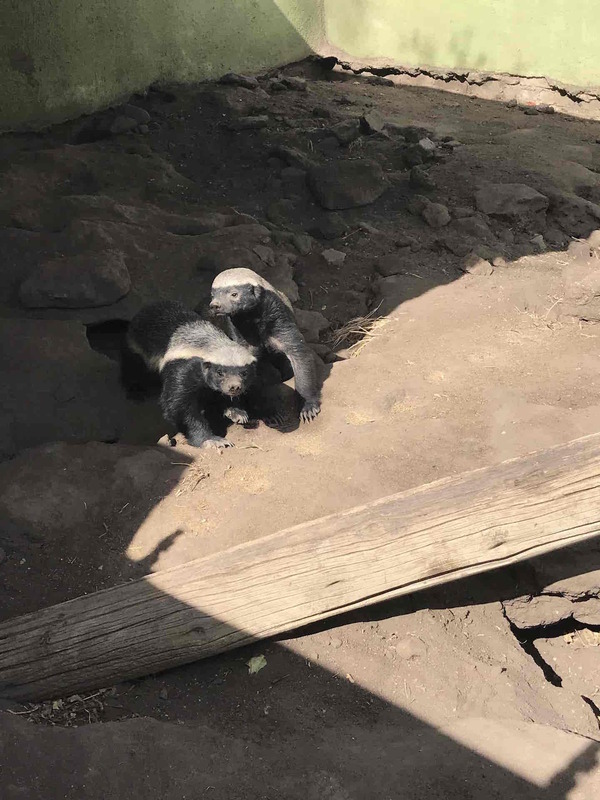 If you have been following our stories, you will know about our honey badger duo Stompie and Badji… well, we recently decided that three is definitely not a crowd and began the process of introducing our newest honey badger addition Nelson, to the boys. 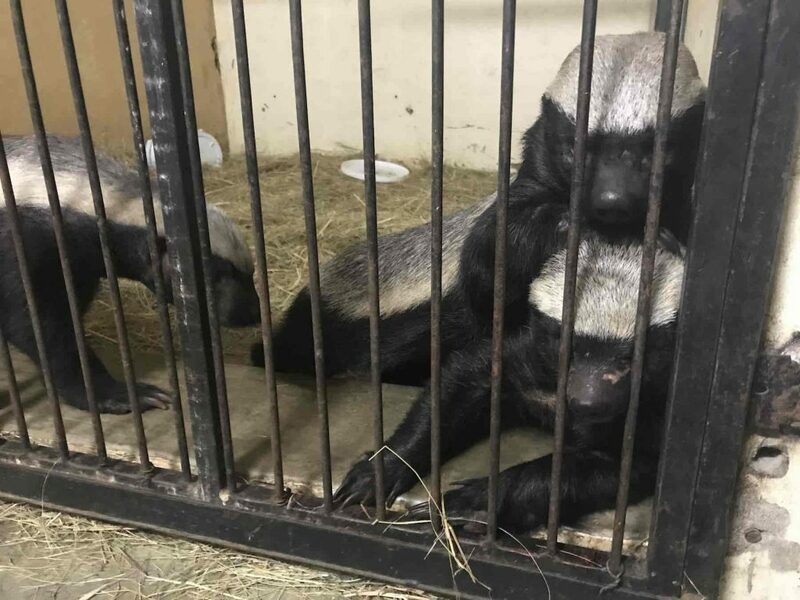 Nelson is an older, male Honey Badger that was admitted to the rehab with broken toes (suspectedly from getting caught in a Gin Trap). Not being able to hunt for himself Nelson lived on a farm where the farmer became quite fond of the resident badger, providing it with food and shelter even though Nelson had eaten more than 60 fowls and 2 geese. After almost running out of fowls farmer decided to ask Moholoholo for help and we drove the 750km (470 miles) to collect him. Because the badger became so habituated to humans and eating farmers live stock, Nelson can not be released back into the wild. The process took just over 2 weeks, every day bringing one of the boys up to Nelson’s enclosure for a few hours so they could meet through the gate and slowly but surely getting acclimatised to each other. We introduced the boys one at a time to each other to minimise the risk that they may gang up on Nelson. Everyone held their breath as we opened the gate for the first time allowing Stompie and Nelson to properly meet… after some initial aggression and a few arguments the two badgers thankfully became the best of friends, tumbling around the enclosure playing, bringing out a cheeky side to Nelson that we had not yet seen. Nelson and Badji’s meeting was slightly less tense with not even so much as a mutter from either badger as they accepted each other’s company instantly. A couple of days later we thought it was time for all three boys to be put together… once again everyone held their breath as Stompie and Badji took their first steps together into Nelson’s enclosure…. Luckily, we could all breathe a sigh of relief as the three trouble makers, in true honey badger style, playfully destroyed our wooden enrichment boxes, digging through the contents together as if they had always been friends. The 3 of them are now in their outside enclosure, renovating their tunnels to accommodate a new roommate.